Eager for an opportunity to sample the Yeshiva University experience firsthand and spend an evening engaged in high-level learning, as well as reunite with friends and counselors from camp and enjoy delicious food, 225 high school students gathered at Stern College for Women’s Beren Campus on Thursday, February 4. The night of learning—part of the Torah Leadership Network (TLN), a program coordinated by the YU Center for the Jewish Future (CJF)—focused on women in Tanach. The Yeshiva University High Schools Annual Dinner of Tribute at the Grand Hyatt Hotel in New York City on March 22 honored Rabbi Hyman and Ann Arbesfeld, YU Benefactors with deep roots in the YU community. 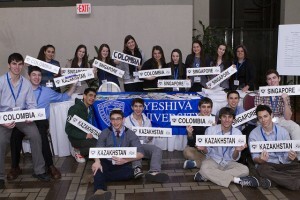 Yeshiva University High Schools (YUHS) will hold their Annual Dinner of Tribute on Sunday, March 22 at New York City’s Grand Hyatt. YUHS will honor Rabbi Hyman and Ann Arbesfeld (Kew Gardens, NY). Rabbi Baruch Pesach Mendelson (Brooklyn, NY) and Mrs. Deena Rabinovich (Kew Gardens Hills, NY) will be honored as Faculty Members of the Year. Students, parents, alumni, faculty and administration celebrated nearly 100 years of commitment to Jewish values and education at the Yeshiva University High Schools (YUHS) annual dinner of tribute at the New York Marriott Marquis in Times Square on Monday, June 23. Dr. Edward Berliner of West Orange, NJ was honored as Faculty Member of the Year by YUHS, which is comprised of Yeshiva University High School for Boys / The Marsha Stern Talmudical Academy (YUHSB) and the Samuel H. Wang Yeshiva University High School for Girls (YUHSG). Yeshiva University High Schools (YUHS), comprised of The Marsha Stern Talmudical Academy / Yeshiva University High School for Boys (YUHSB) and the Samuel H. Wang Yeshiva University High School for Girls (YUHSG), will bestow Dr. Edward Berliner with the Faculty Member of the Year award. Dr. Berliner will be honored at the YUHS Annual Dinner of Tribute on Monday, June 23 at 6 pm at The New York Marriott Marquis in Times Square. Prominent members of the West Orange, NJ community, Dr. Berliner and his wife, Debbie, are proud parents of three YUHSB alumni: Avi ’99, Josh ’01, and Jon ’04. Joyce Tessel worried about the relevance of her class project. The 18-year-old senior at Samuel H. Wang Yeshiva University High School for Girls (YUHSG) “didn’t understand why talking to Holocaust survivors” and others who were connected to World War II, could be important to her young life. “But I was so wrong,” she said. Many teachers in Jewish day schools across the United States juggle teaching duties in addition to administrative responsibilities. The questions flew fast and furious. Students were given just 10 seconds to prove they knew their stuff. In the end, North Shore Hebrew Academy of Great Neck, NY, knew their stuff better than the rest and captured first place in the second annual Sy Syms School of Business Stock Market Trivia Competition on April 5.